On this area we were showing MicroEJ Operating System and developer tools for IoT in action. 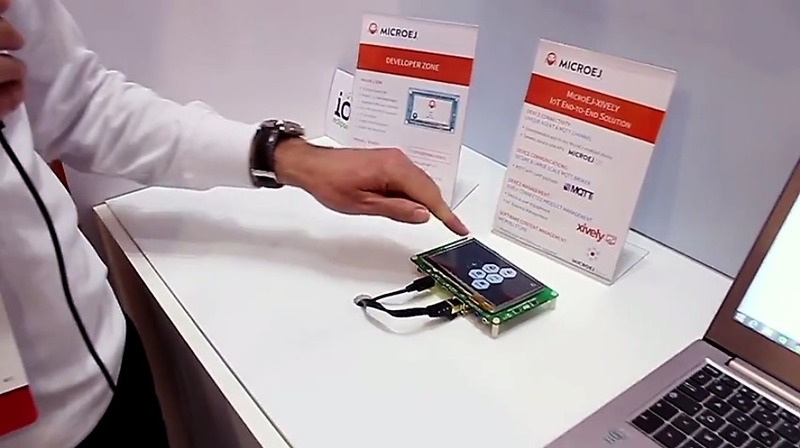 Two different demonstrations of MicroEJ were running on a STMicroelectronics evaluation kit. The first one showed how to create your IoT application using MicroEJ and explains that each application is running on top of MicroEJ OS on a sandboxing layer. The second demo was developed with MicroEJ developer tools for IoT with our partner Xively. It uses IoT cloud connectivity and cloud platform technology. We were showing here how easy it is to get some data and send it up to the cloud into a platform for various processing, business intelligence, and other cloud applications. In the video of the demo, you can see MicroEJ Studio running on a PC. MicroEJ Studio is one of our developer tools for IoT devices built on Eclipse. It is free and available for download. In this demonstration, we have a very simple Hello World application written in the Java language. As MicroEJ provides a virtualization layer that separates the software from the hardware, we’re capable of running this application on a PC simulator. With the simulator, it is very easy to do early prototyping and debug of your application. Here, we just modified the text and entered Hello Vegas. Then we just pushed a button to deploy the application to the target. And here we go! Hello Vegas is now displayed on this board. The code that is now running on the target board is exactly the same as the code that was running on the simulator. 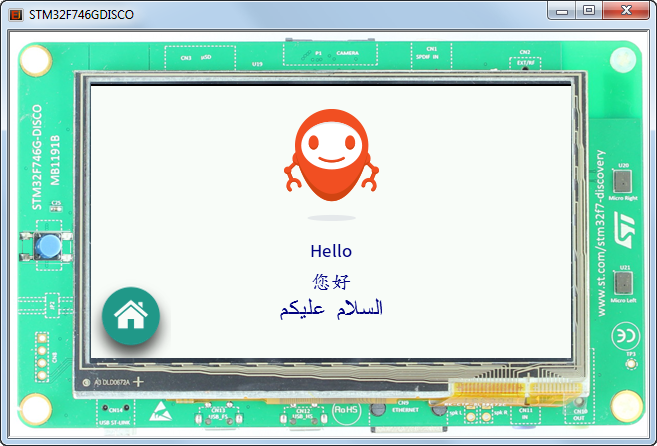 In the other hand, this small Hello World application is available among other applications that can be pre-installed and flashed or dynamically loaded, installed, and uninstalled if a connection to the online MicroEJ Store is available. All these apps are running on top of MicroEJ OS on a sandboxing layer. It means that each app is running independently from each other. The sandboxing layer also offers additional security and safety for software execution. This demonstration of MicroEJ developer tools for IoT shows how to collect some data from a sensor and send it up to the cloud. Here, we’re simulating a temperature sensor. We’re sending this data over the internet using a xively application. The launch of the app establishes a connection to the Xively platform in the cloud using the MQTT protocol. Note that it is is a background application. It means that it has no GUI. If we move now to the Xively web interface that is connected to the board, and start the application for publishing the data, the temperature data is published every second over the MQTT broker from Xively. The published data appears in the web interface.